A serious humanitarian crisis is developing at Holman prison as correctional officers continue to walk off of the job amid concerns about safety and apathy from Warden Terry Raybon and the office of ADOC Commissioner Jefferson S Dunn, as violence, including deadly stabbings and assaults continue to mount. 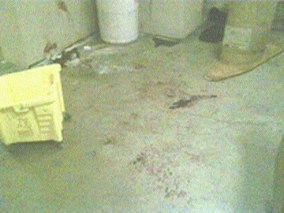 Several officers expressed dismay and fear after learning that two of their fellow officers, Officer Brian Ezell and another officer, reported to Warden Raybon that they had knives drawn on them and their lives threatened, and that neither Warden Raybon, nor Commissioners Jeff Dunn and Grantt Culliver would take any action to ensure their safety. Both of these officers then quit. Several other officers have also quit in the past three weeks after witnessing a stabbing of a fellow officer in the temple and who had remained hospitalized with life threatening injuries until he was pronounced dead earlier today. This after a former warden, Carter Davenport, was stabbed in March amidst back to back riots and other violence at Holman. Now, after seeing Warden Raybon release approximately 20 people from segregation on September 13, 2016, most of whom were all in segregation for violent incidents (only to see several stabbing take place, including one critically injured and another losing an eye), a total of eight more officers have either quit or turned in their two week notices. Officers are expressing concern that the Commissioners of the ADOC are intentionally exacerbating violence at the expense of human life in efforts to push forward their plan to extort the public for 1.5 billion to build new prisons in next years Legislative Session. 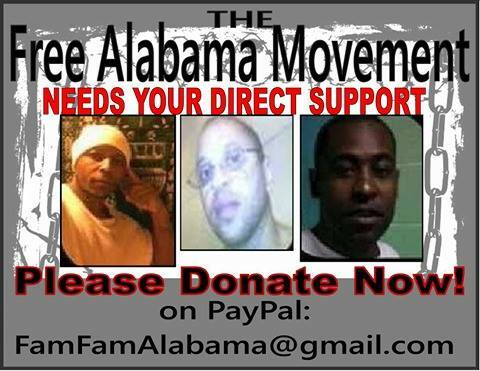 Officers have began to express support for the Non-Violent stance of FREE ALABAMA MOVEMENT and their efforts to expose corruption, violence and other issues plaguing Holman and other Alabama prisons, and have went so far as to make repeated requests to Warden Raybon for the release of F.A.M. co-founder and organizer Kinetik Justice from solitary confinement, because officers now feel that he is being wrongfully detained and because he has repeatedly demonstrated the ability to conduct peaceful demonstrations at Holman prison to bring attention to issues within the ADOC and Holman prison. We are asking that everyone call Commissioner Dunn and Warden Raybon and demand that they post daily reports of the staffing levels and incidents of violence taking place at Holman as a matter of public safety. 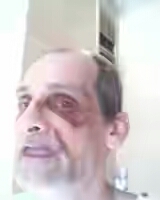 We are further requesting assistance in finding a Human Rights attorney and human rights observers to report to Holman immediately, as the level of violence is skyrocketing, and the men at Holman are left in a virtual war zone to fend for themselves, while officers continue to walk off the job in what is already the most understaffed prison in America. Officers are so afraid to enter the dorms that routine security functions like conducting count are being done by the incarcerated men themselves, and video footage attesting to this fact are widely available online and across social media. Family members of those incarcerated at Holman are requested to call Commissioner Dunn and Culliver continuously, and demand that their loved ones be immediately removed from Holman, as there are insufficient officers to secure the prison. First of all, I want to correct this article and say that we were only on lockdown for a couple of hours. Security is still just as lax as the afternoon it occurred. His name in here was Manny. He and the other inmate had gotten into an altercation earlier that morning. 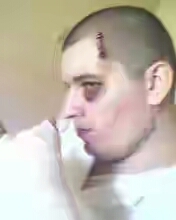 The prison knew about this altercation and got the two inmates to sign a living agreement stating that they would not harm one or the other again. The prison then placed both inmates back into the same dorm that they were living in before this occurred. So what do you expect? 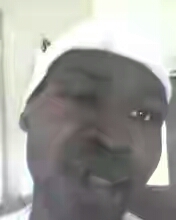 The guy murdered Manny in his sleep. Because he could. Because the Department of Corruption let him by placing both of these guys back in the same dorm after they had already fought. Manny’s blood is on their hands. And so is anyone who refuses to do nothing about the overcrowding our prison system faces. 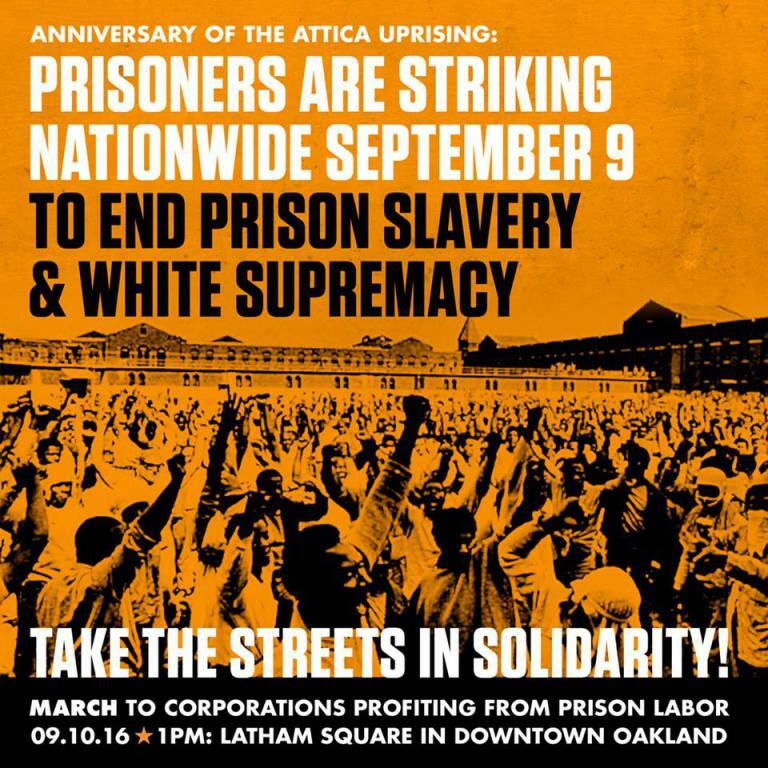 On May 2, 2015, family members, friend, and loved ones of those who are incarcerated in ADOC are being asked to attend the protest at St. Clair prison against the police brutality by ADOC. On April 17, 2017, Lt. Ronald Carter sparked more violence and police brutality at St. Clair prison when he beat Xavier Austin while in handcuffs. On this same night, another officer left his assigned security post and attempted to assault another man. These assaults, and the acts of self-defense in the face of this violence resulted in the RIOT TEAM being called into St. Clair on April 17 2015, and resulted in over 25 men being beaten by the RIOT TEAM. The ADOC is attempting to cover up this police brutality with a bogus investigation that has resulted in over 10 black men being charged with assault against Lt. Carter, but there have been no calls for any investigation into the police brutality claims, which were recorded and photographed. The ADOC is charging these men – all Black – in this matter based on “confidential sources”, but with no evidence of any kind, and in some instances even where ADOC’s own records show that these men are innocent. Lt. Carter has been sued in multiple civil action and class action lawsuits for abuse as an officer while at Donaldson, including one beating that resulted in a man’s death. 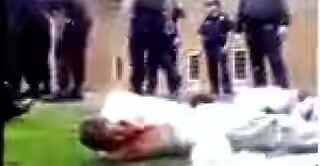 While at St. Clair, Lt. Carter has been named in more lawsuits for police brutality, several pending rigt now, including one filed by Bryan Stevenson of EQUAL JUSTICE INITIATIVE, which includes an incident where Lt. Carter choked a handcuffed man nearly to death and another man, Ventura Harris, was beaten by Lt. Carter’s subordinates while he stood and watched. 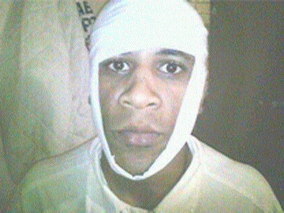 Mr. Harris required over 15 staples to patch his skull back together. Also, several officers signed a petition that was circulated at St. Clair by Officer Brian Fife, where they were complaining about the abuse and bullying tactics by Lt. Carter towards officers. Lt. Carter has also been accused of sexual harassment by at least one female correctional officer. We are asking all family members, friends, loved ones and supporters to attend this protest to “STOP POLICE BRUTALITY BY ADOC”, and to demand justice for those who have been wrongfully accused and/or beaten as a result of the actions of Lt. Carter. Stop this cover-up now and demand accountability against police brutality. 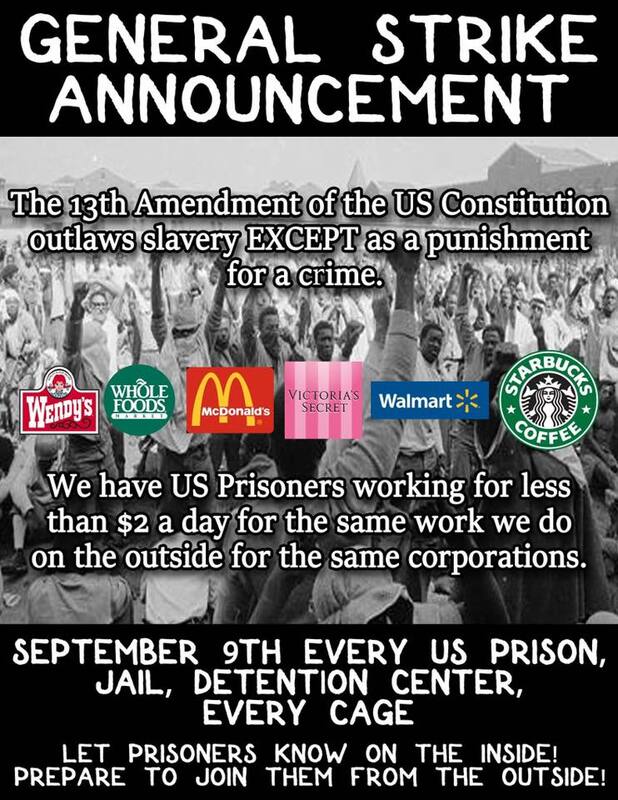 Support the Strike at St. Clair Correctional Facility in Alabama! Scroll down plz for Updates! Today, 48 hours before a peaceful work stoppage starts on Sunday, March 1, at St Clair Correctional Facility (SCCF) in Springville, Ala., riot police have been sent to the prison to beat, torture, and intimidate the men incarcerated at SCCF, whose demands include an end to severe overcrowding and filthy living conditions. 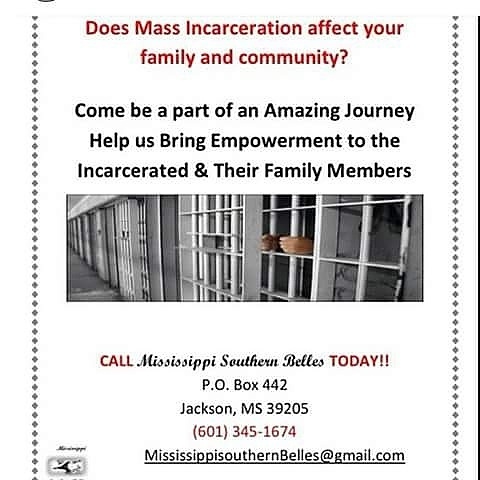 Call SCCF’s warden, Carter Davenport, at (205)467-6111. Tell him to stop the retaliation against the prisoners, who have a right to peacefully protest against their inhumane treatment. Spread the word to others. We must flood the prison with phone calls and the ADOC with email. 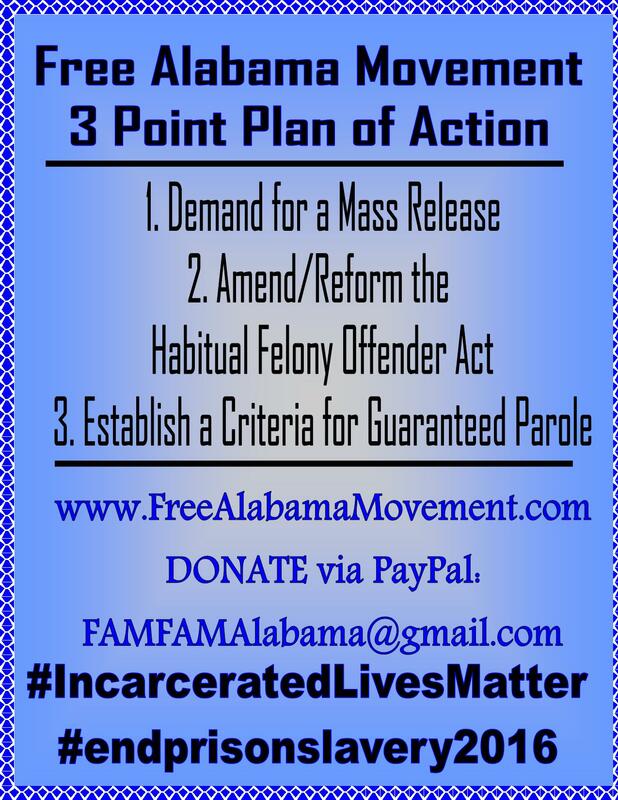 On January 1st, 2014, the Free Alabama Movement was launched as a cross-racial collective action, with work stoppages at Holman, St. Clair and Elmore Correctional Facilities. This is an inside-outside solidarity network that is working closely with the Ida B. Wells Coalition. We are looking to broaden the support for these courageous and conscious prisoners. Literature created by these prisoners is available through the South Chicago ABC Zine Distro / P.O. Box 721 / Homewood, IL 60430. Check their website, etc. Thanks to the efforts from the People who supported F.A.M. this morning and afternoon, the Riot Team has been ordered to leave St. Clair prison. Yet again, Brian Stevenson (EJI) seems to continue to screen his calls from the family members of the men at St. Clair. Equal Justice Initiative has filed a class action lawsuit, but they have not returned to the prison to take any steps to protect the men from retaliation from the ADOC. In fact, despite several requests to do so, EJI and Brian Stevenson have not sent any notifications to the “class” that they claim to represent informing them of how to report retaliation or new claims. No monitors or class representatives have been put in place at St. Clair, and many of the men at St. Clair don’t even know that the “class action” lawsuit includes them. If you have a loved one at St. Clair, we are asking that you contact EJI and demand that Brian Stevenson protect the class of plaintiffs that he and his “experts” will be getting PAID to represent. WHY THE ADOC CHOOSES VIOLENCE INSTEAD OF NON-VIOLENCE. PART II. This is not the first time that the ADOC administration has sought to stop positive programs from being implemented. At St. Clair, a program called Convicts Against Violence was founded by Mr. Earl “Tyrese” Taylor in efforts to stop violence at this prison. At the time, this was the only program that offered any type of educational and mentoring classes in the dorms that house the majority of young black men. The success of this program in stopping violence and educating these men cannot be disputed because ADOC’s own record prove that violence was down to all-time low levels, and class enrollment was over 98%. But crime pays and racism persists in Alabama, and when Black people start creating solutions to problems like illiteracy, violence, drug addictions, mentoring and leadership classes for misdirected gang members, conflict resolution and mediation, then these programs come under attack. At first, a “noose” was hung in L-2/ C.A.V. dorm by racist staff along with a message to “kill” all “niggers”. The unjustified and ongoing solitary confinement of the F.A.M. 3, James Pleasant, Robert. 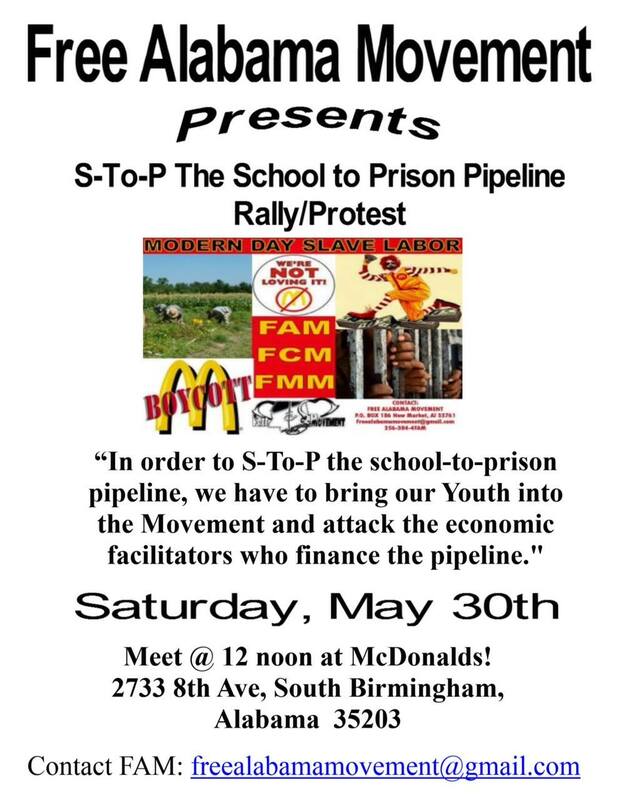 E. Council, and Melvin Ray for the assumed (but unstated) purpose of organizing Non-Violent and Peaceful Protests for the continuing civil and human rights violations in Alabama prisons continues. In the face of their detention, it has become even more evident that the ADOC tolerates and accepts (and even promotes) violence over non-violence. Since the inception of F.A.M., there have been over 6 murders to occur at Holman and St. Clair prison, one riot, over 60 stabbings and many assaults on officers, by officers, and amongst the men incarcerated, and not one measure has been taken to stop this violence — except FREE ALABAMA MOVEMENT. During the historic peaceful demonstration by F.A.M. to start the year, not a single act of violence occurred, and the overriding message from F.A.M. leaders was that the violence must end, and education, rehabilitation and re-entry preparation must begin.